FRESNO, CA (KMJ) – PG&E says more customers could lose power from Friday’s storm system. The utility says it has a plan to safely deal with outages and restoration work. As of Thursday, PG&E had 13,597 customers out system-wide, 11,415 of which are storm-related. They restored 474,000 customers since February 1. The biggest challenges for crews are gaining safe access to work locations thru the heavy snow and the difficulty of the work itself. The utility said it planned to restore a large chunk of the remaining customers by the end of Thursday. In the Stockton Division, 3,041 customers had power out, most with no estimated restoration time yet due to tree hazards and ongoing access issues. 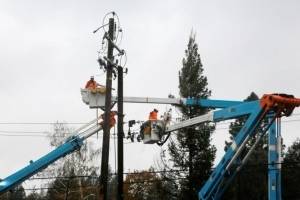 In the Yosemite Division, 3,023 customers had power out, and PG&E expected to have most of them restored Thursday evening, with the remainder by 10 p.m. Friday. The remaining outages in the Fresno area are in very remote areas, affecting less than 300 customers. They are communicating directly with customers who can expect to remain out again Thursday night. There is another storm system arriving Friday morning. It is not expected to have as wide of impacts as this latest round of storms, but there is a possibility of storm-related outages Saturday, especially in the Stockton and Yosemite Divisions. PG&E is urging customers to be prepared. See tips below. • Have battery-operated flashlights and radios with fresh batteries ready. Listen for updates on storm conditions and power outages. • If you have a cordless phone or answering machine that requires electricity to work, have a standard telephone or cell phone ready as a backup. • Keep your cell phone charged, and have a portable charging device handy. • Freeze plastic containers filled with water to make blocks of ice that can be placed in your refrigerator/freezer during an outage to prevent food from spoiling. • If you have a stand-by generator, notify PG&E and make sure that it’s installed safely to avoid risking damage to your property and endangering PG&E workers who could be working on power lines in your neighborhood. Information on the safe installation of generators can be found on our website at www.pge.com/generator. • Candles pose a fire risk. Avoid using them during a power outage. If you must use candles, keep them away from drapes, lampshades and small children. Do not leave candles unattended. • If your power goes out, unplug or turn off electric appliances to avoid overloading circuits and fire hazards when power is restored. Simply leave a single lamp on to alert you when power returns. Turn your appliances back on one at a time when conditions return to normal. • Sign up for PG&E’s outage alerts, which provide customer updates via phone calls, texts or emails. Go to your My Energy account or click on www.pge.com/outages for more information. • Check to see if other neighbors are affected. This will confirm if an outage is impacting the neighborhood or just your residence. • To report an outage and to get the latest information on outages in your neighborhood, call PG&E’s Electric Outage Information Line at 1-800-743-5002. Note that PG&E’s phone lines may become very busy during major storms. • Stay away from downed power lines. Treat all downed power lines as if they are energized and extremely dangerous. Keep yourself and others well away from them and immediately call 911, then notify PG&E’s 24-hour emergency and customer service line at 1-800-743-5002. • If your vehicle comes in contact with a downed power line, stay inside. The safest place is in your car as the ground around your car may be energized. Honk the horn, roll down the window and yell for help. Warn others to stay away as anyone who touches the equipment or ground around the vehicle may be injured. Use your mobile phone to call 911. Fire department, police and PG&E workers will tell you when it’s safe to get out of the vehicle. • If there is a fire and you have to exit a vehicle that has come in contact with downed power lines: Remove loose items of clothing. Keep your hands at your sides and jump clear of the vehicle, so you are not touching the car when your feet hit the ground. Keep both feet close together and shuffle away from the vehicle without picking up your feet.